UPS_The_Last_mile_destroys_the_brand, originally uploaded by shashiBellamkonda. What do I think of a company that efficiently transports a 1lb package for me 2800 miles coast to coast from Sunnyvale . CA to Gaithersburg MD but fails in the last 3 miles to do justice to its brand by making a efficient delivery ? This is the second time that this happened to me that the driver never came to my door and reported an exception in the UPS tracking system that no one was home. The first time was a a few weeks ago. The UPS driver had left no note even though there was someone present the whole day. I had briefly admonished my daughter for not paying attention to the door bell and believed UPS was right. Called them and requested they hold the package for me to pickup. 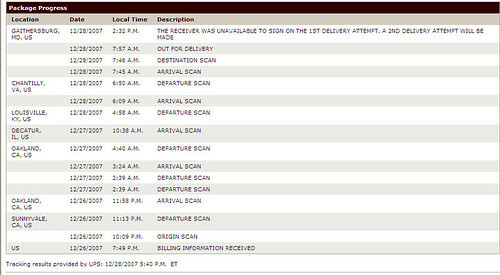 UPS customer service is 1 800 PICK UPS ( 1 800 742 5877 ) but you will not find it easily on their website. The next day I drove from my work in Virginia on a riany day to reach the UPS center at 7.03 only to be told they are open till 7 p.m ( I agree this sounds a lot like whining ). The next day i wait till 8.30 a.m when they are open and go to pick up the package. I won't tell you how inefficient the system is at this center but the experience left me wishing I would have been better off if they had a robot to assist. Anyway that episode forgotten- I await another package again from UPS. I am impressed that their phone system calls me and tells me to expect the package the next day and the driver cannot leave it without a signature. I am not worried- I have taken the day off and can wait for this package. The delivery day is today. I wait for the package between 8 a.m and 7 p.m . When I leave i tell the kid to be near the front door in case the bell rang. I call from the car to make sure my instructions are being obeyed :). At 5 p.m I cannot stand the suspense. I login to my UPS account to track the package. I am livid with rage that the delivery has been reported as a exception at 2.32 p.m (THE RECEIVER WAS UNAVAILABLE TO SIGN ON THE 1ST DELIVERY ATTEMPT. A 2ND DELIVERY ATTEMPT WILL BE MADE) I check the door for a slip from the driver - there is none. I ask my kid if the door bell was ever heard. My only conclusion is that the driver had never made it to my door. I search again for the UPS customer service ( Cannot find it on the website and have to Google " UPS customer Service Phone"). The lady handles my call efficiently takes my complaint and tell me I will get a call within an hour. Its 5.32 and i have .5 hours approx before the center closes and this is Friday. I trust her and wait. The Phone rings after 30 minutes and the voice on the other side is apologetic and says the matter will be taken up with the driver and his supervisor. COuld I come and pick up the package. I agree and o there to pick up the package and the problem is resolved. Now creating this blog post has taken up some time for me . Why am I doing it ? I feel cheated. It seems like the drivers when faced with a package that needs a signature probably do not bother even stopping and checking if the person is at home. It is also possible that no one ever complains- since most packages are just delivered at your door without requiring a signature. I never had a problem receiving packages that did not require a signature. I am blogging because my feelings are hurt. UPS is a big company . It does not have the need to correct a broken system because what can the consumer do ? Go to USPS ? Insist the supplier use FedEx? I have no choice in what shipping method the seller uses but I pay for 2 day shipping. This does not sound right. Friends advised me to leave a signed slip and give cell phone number on the door for the UPS guy. Great suggestion.. But if he came to the door will he not ring the bell and find a very eagerly awaiting me bounding from my Twitter screen to go to the door. If someone from UPS ever sees this blogpost- what am I expecting? I hope they just follow the rules- ring the doorbell , wait for an answer and leave a slip if no one answers. Is that too much to expect. I chanced upon BreakingNewsOn during one of my trolls on the Twitter public timeline when I first began using Twitter and since then I have been following BreakingNewsOn.. They have been great about breaking the news first. Yesterday I was amazed at their breaking of the Benazir Bhutto Assassination Story and generated a lot of buzz on Twitter. I decided that I should write about them and encourage everyone to follow them. I got in touch with BreakingNewsOn’s founder , 20 year old Michael van Poppel and interviewed him on GTalk. 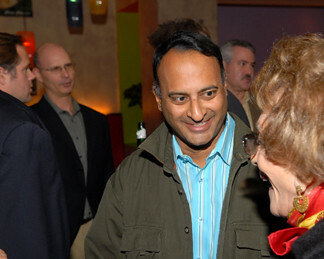 Shashi: What is BreakingNewsOn ? Michael: BreakingNewsOn is a "micro-news service" and is specifically aimed at bringing breaking news as soon as possible. 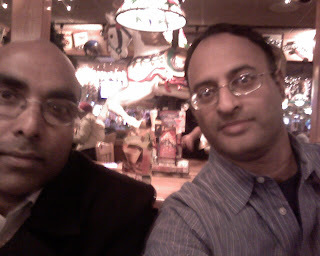 I founded BreakingNewsOn on May 20th of this year and its size is growing rapidly. Some more details can also be found at Wikipedia: http://en.wikipedia.org/wiki/BreakingNewsOn . Shashi: Do you have a website? Michael: At this time we are only active on Twitter but a website is set to be launched before the end of the year. It will be very active and focused on breaking news. When necessary, depending on the size of the story, live streams, email alerts, in-depth details and more will be made available. BreakingNewsOn is able to provide live streams to major international news networks such as MSNBC, CNN, Al Jazeera and others. Shashi: Do you consider yourself a start-up? Michael: Yes, BreakingNewsOn is more like a pilot. However, we will continue the Twitter service when the website is online. Off course, when it is launched it will be announced through Twitter. Shashi: Do you have other Twitter ids? Michael: BreakingNewsOn is the main twitter id at this time.. Our second Twitter id can be found at http://twitter.com/LivePressAlert . It provides live quotes from major press conferences we are following. (warning: massive number of updates during news events). We do have several other Twitter id's which are in a test phase but will not be continued. Shashi: How do you gather the news? Michael: We get information we make public straight from news wires such as the Associated Press, Reuters, AFP and others. Additionally, we gather information from official’s sources like the United States Geological Survey and do our own research. We will contact local officials depending on the urgency of the story. Local news networks also contribute to the news brought by us. Because Twitter allows a maximum of 140 caracters per message, we are often unable to credit the exact source. What makes BreakingNewsOn different from other news networks is simple. We make the news public as soon as possible. When we get credible details of a breaking story we will immediately make it public and gather additional details. "Normal" news sources do often wait for official confirmation and this makes it a lot slower. The method we use is a risky one though. Sometimes the story turns out to be much smaller than the initial reports suggested. Shashi: What is the biggest exclusive you have had so far ? Michael: Our biggest exclusive is a stunning one. On September 7th we exclusively obtained the first Bin Laden tape in years. BreakingNewsOn received the full and unedited video before anyone else. The video was obtained through own research. Details and a screenshot were quickly posted to BreakingNewsOn and it was later sold to Reuters. Within minutes after reaching an agreement with the news organization, the video was made available to television stations across the world. Networks in the United States, UK and others interupted their programs to show the first images which were originally obtained by BreakingNewsOn. The first alert on the Bin Laden tape can be found at http://twitter.com/BreakingNewsOn/statuses/253312392 . Another interesting read can also be found at: http://insidecable.blogsome.com/2007/09/13/cnns-i-report-did-not-respond-to-bin-laden-video-offer-from-web-trawler/ . Shashi: Do you have a blog ? Michael: BreakingNewsOn ran a pilot of a website in October/November and was later taken offline. The website was immediately a success and a full news website is due soon. Shashi: What’s your education background - did you learn journalism or are u a techie. Are you a star trek fan too? Michael: I did not study journalism but the other editors of BreakingNewsOn have; they work for newspapers and international television stations. Yes, I was a "Trekkie" in the past. Michael: Unfortunately, I have little time for movies lately and my interest in the series ran out a long time ago.. In the past I ran a popular website called Sci-Fi Universe which was known to have exclusives on television series. Shashi: BreakingNewsOn - how does it make money? Michael: At this time we do not make any money out of it. However, we plan on using some kind of advertisements. Shashi: Whats your utlimate vision - how do you see this expanding? Michael: My goal, at this time, is to make the website a success and a credible news source. Shashi: What do you do for fun? Michael: Besides BreakingNewsOn I'm always busy - working, school, but I do like to go out with friends as much as I can. Continuing My Knowedge Quest on Twitter - diff between a geek and a nerd ! My daughter is very tech savvy but she is more responsible with her time than me. She distributes her time between her school activities and reading and writing well so she is not on Twitter yet . When she asks me what the difference between a Geek and a nerd is , I yell for help and Twitter delivers. You will enjoy reading the responses. The answers were intelligent, funny and helpful. I am awed by the people who reponded . If you would like to add the conversation it will be awesome to get your comments. markdavidson : A geek tinkers with stuff. A nerd researches stuff. There's a fine line between a computer nerd and a computer geek. AlbertMaruggi : nerd knows a lot, but can't really find the right application for it and people are a necessary element of this world. How's that? scottstead : geek is a more tech/chic term i think, while nerd i think has a more negative connotation? agree/disagree? shelisrael : A geek is technical and socially unacceptable. A nerd need not be technical, maybe collect bugs, but he/she is also socially out. hmason : I tend to go with the definition that geeks are nerds + technology. Dorks are geeks or nerds without the smarts. tndaisy1960 : A geek gets things done; a nerd just wishes he could. rustybrick : geek loves tech stuff and nerd needs tech stuff ??? @ColleenCoplick i'm familiar with SWAG, which are all the freebies & giveaways from wherever. is sCHWag something else or just a diff spelling? @WillBrown, schwag is the misc free branded pens, notebooks, etc you get when you go to conventions. @dacort Schwag is slang for sweet, or cool. At least that's how I use it. I don't know where it came from. It also indicates free gifts. @danieljohnsonjr I think schwag refers to the goodies you get at a conference, etc., usually in a goodie bag. Thanks everyone. I have removed responses I got from my friends whose updates are protected. 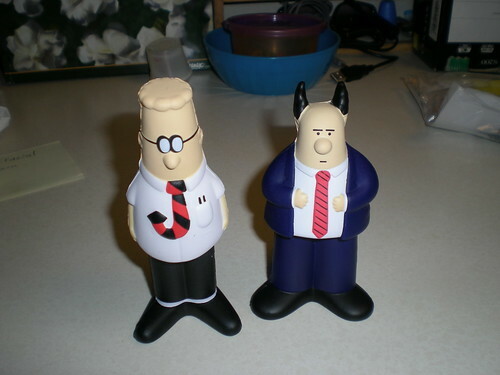 http://www.thinkgeek.com/geektoys/cubegoodies/9d94/, originally uploaded by shashiBellamkonda. I had told all my Twitter friends that I was moving jobs within Network Solutions and got some awesome encouragement in the form of direct messages, comments on the blog and links from their blogs. Today as i opened a package left at my door i was awestruck to see ,Tojosan had sent me a awesome gift to encourage me in my new position. 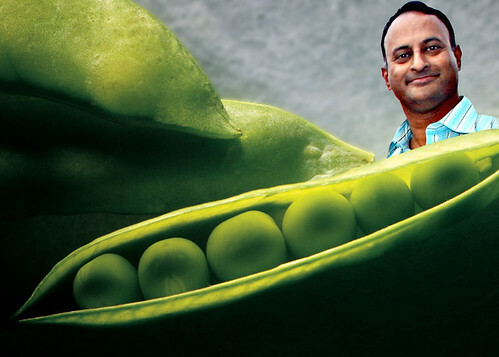 Frozen Peas Friday Avatar - Frozenpeafund,com, originally uploaded by shashiBellamkonda. Susan Reynolds is the nicest person you can meet online. Not so long ago she announced that she was being tested for breast cancer and all of us had to pause and ponder. Why does this happen to nice people? Please join the Frozen Peas Fund group on Flickr. Donate for breast Cancer Research at http://frozenpeafund.com/. AnnOhio is a tireless do gooder. Her post on Frozen Peas Friday says she has sacrificed even her regular Friday Avatar ! She is so full of cheer and humor. Chris Brogan has included links and his post will tell you how the Frozen Peas Fund this unfolded. This is a amazing story of the community coming together for a good cause. I fired away my previous post while still riding the Metro yesterday. As I was riding back home I saw this sign in the Metro which explains the "No Eating Rule". That makes sense . I am curious from you if your city has a Metro - is there a "No eating Rule" . 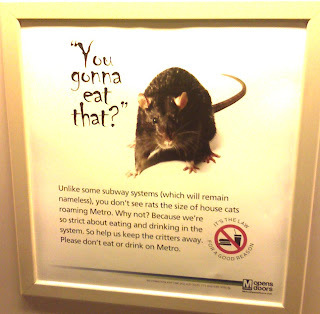 if there isn't have you seen any rats in your Metro. I think the rule is really dumb. I say this as the girl in the seat in front is eating pretzels. Fine those who litter the metro heavily but people snacking its a essential activity. Of course last year a teenager was handcuffed for eating french fries on the metro- come on we live in a civlized world and we have better things to do than stop people from eating. 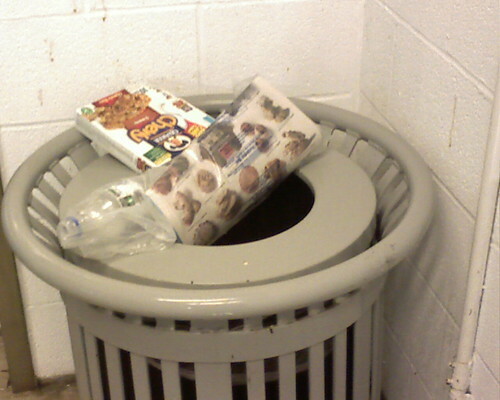 I think my metro eating rule violater has finished her snack. I was really struggling to put my thoughts into a Tweet and as I kept misspelling words so that they would fit I was fervently hoping my daughter wouldn't read this post.If she did my authority to tell her to dot her "i"s and cross her "t"s would just disappear :). Then I had horrible thoughts of the punishment the "Language" Police would inflict on me. Of course the consoling thought was that if I created a new word it may find itself in the Washington Post like w00t did I braved myself and asked this question on Twitter. Do you think the language police will be after me because I have to have typos to make the message fit the 140 character Twitter limit? If only you knew this was not garbage, originally uploaded by shashiBellamkonda. I don't want newspapers to die. Thats my quality time and sometimes that morphs into family time. The plastic wrapped package above is today's (12/12/2007) Washington Post. It does not deserve this place. Newspapers particularly good ones(IMHO) like the Washington Post have a place in our life. About an hour ago as we were having breakfast - my wife, daughter and me had a discussion on how nice the Cookies in the food section looked ( Thats what you can see on the top in this picture). The conversation was going to evolve around how we could make the weekend a fun activity and make some of these cookies. I am heavily plugged in to the Internet and to me a Newspaper is like a RSS reader. It usually does a good job of collecting news and information and if it doesnt I just move on. I felt passionate enough on this to stop and take this picture. Washington Post please do not take this to heart . I am sure the poor soul who threw this paper must have had a million things on his mind. I am not sure how I got this link. But it was on my screen yesterday. It must have been an intervention of positive forces that made me click on the link. The video is inspiring and awesome, in fact I am behind 6 Million people who already viewed this video. Watch and get inspired. "If this is democracy, why do we want it?" When I first landed in Moscow in 1989 as an employee of a USSR-Indian joint venture restaurant the dollar was worth .70 kopeks officially and sold on the streets for 15 rubles. We left India with essentials like toothpaste, soaps etc in large numbers in our luggage which were in short supply in the USSR ( I am using the USSR because the Soviet Union was still intact). In those days the typical commute was a 5 min walk to the Shukinskaya metro. The Moscow Metro was very efficient and we made the commute from our Metro to Metro St 1905 in 15 minutes. The metro was amazing it cost 5 kopeks for entry and you could exit anywhere. 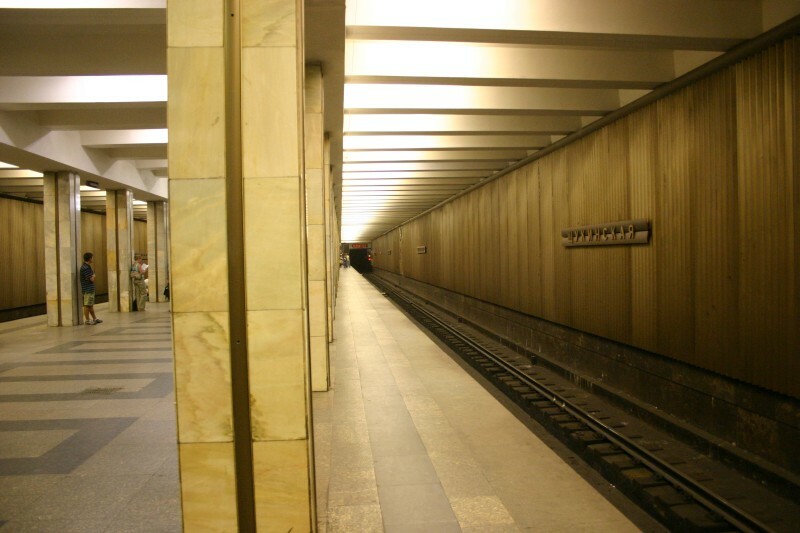 During peak hours the metro frequency was 40 seconds to 3 minutes. Here is a YouTube Video that shows a line but there were no lines during those days. My salary was paid in equivalent currency so my first salary was 160 rubles and when I left Moscow in 1992 it was $160,000 rubles. Most Common folk did not have the luxury of having their salaries linked to inflation. During those days retirees had to start selling their personal belongings to survive. Retirees made statements like "At least under the Communists I wasn't hungry," Crimes and lawlessness became a big problem in Moscow. One day while I was at work my apartment was burglarized and my TV VCR and music system were stolen. I am not a political commentator and will not tell you what is right or wrong but I guess if you ask a hungry man if he wants food or democracy I think he will choose food. That si what the Russians have done in these elections. I get a good laugh as I watch the humorous comments on Twitter. This lead me to tweet:- " Who should we vote for the "most humorous on Twitter"? Any Nominations? " The response to this Tweet was great so it started getting difficult to manage. So the next thing was to make this a Poll. In the interest of not being self promoting I decided to ask help for someone to host this poll. The first offer for help was from @Technomom (She is a real hero - despite having a fall the next day she collected the info and launched the polls). please direct any brickbats at me as I am solely responsible. We got 33 nomnations and at last count 80 people had voted. The Poll is at http;//tecnomom.com. Vote as this is light hearted fun. The polls close on Sunday at mid-night. Update: Should We have a monthly "Funniest on Twitter" Contest and instead of names poll fun lines? People can submit their own one liners or others one liners and everyone can vote on the funniest one liner? If you think its a good idea please comment here. 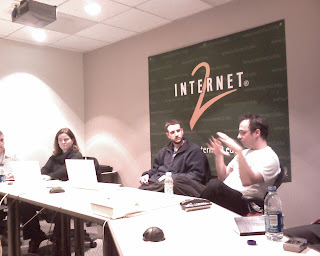 This was the first meeting of the DC Social Media Club that I attended. The consistent theme of all the social media events I attend is that the speakers are knowledgeable but humble. Feedback, questions, clarifications are expected. Then the lecture takes on the form of a really show as the speaker explains a tool and then someone in the audience actually uses it. This happened during the Social Media Club Dc meeting today when newmediajim mentioned Utterz and Johnny Godstein took out his phone and "uttered" immediately. NewmediaJim talked about how he evolved into the Social Media Space. What were the highlights. Advice on Social Media Dos and Don'ts. I want to get hold of his presentation - it was very good. Twitter should use him as their evangelist. - Choose to follow people who interest you with their posts. NewmediaJim recommends ConnieReese, Chrisbrogan. Rana Shobhaney ; Did you know this side of her ? Has Technosailor moved to Falls Church ? He was spotted in a Falls Church Starbucks? Did Marc Benton beat NewmediaJim in the number of followers? 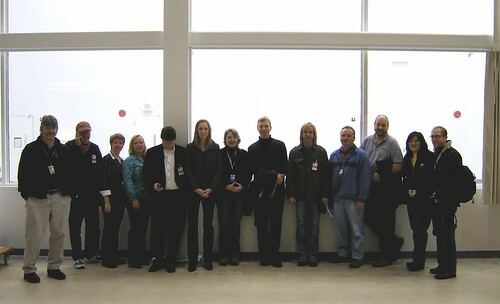 What's a Cold Fusion Guru doing in the Social Media Club. 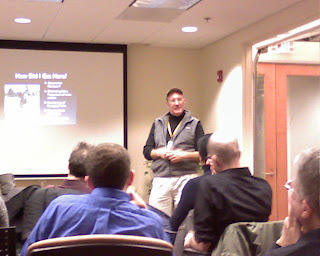 Michael Smith (Teratech.com) came to the meeting. he doesn't Twitter but he manages the Cold Fusion User group in Maryland. it was great to meet him. Randolph Adair will be starting afresh on Twitter and needs info on how realtors can make use of Social media. Larissa Fair was runnning the show and as acive as ever. I wish I had more time to chat. I met a ton of other folks - Jared Goralnick I think I was sitting with @barn and @kyinc, Viget labs and Joe loong. I Missed meeting a couple of other people from this evening. if you dont find a mention here please let me know and I will set that right. Beginning December 18, 2007, we plan to end support of direct consumer uploads to Brightcove.TV. As a result, you will not be able to upload new videos to Brightcove.TV after December 17, 2007. But videos you have already uploaded to Brightcove.TV will remain available on the site and through your Brightcove.TV channel. Videos you have embedded in other sites and blogs will also continue to play. If you have a Brightcove Platform or Network account, which means you use the Brightcove Console, then you will still have the option to promote videos on Brightcove.TV. Brightcove.TV will continue to be a guide to great video from Brightcove media and business partners. The site will have new videos added to it daily from these partners and these videos can be saved as favorite videos in your channel. If you work for a media company, marketer, non-profit, or business and are looking to purchase the Brightcove platform to publish and distribute video on your own site, please visit the Brightcove Products Overview section of our website. We appreciate your interest in Brightcove and apologize for any disruption this change may cause you. Small Biz Survival: Want to Get FREE Tax Tips? Mary Ellen Slayter wrote a great article on getting an MBA and how important it is to get experience first. An MBA from a top school is often seen as a guaranteed investment, boosting your earnings as well as your career trajectory. But how do you know when it's the right time to pursue a master's degree in business? "You have to be ready," said Sam Kang, associate director for recruiting at the University of Maryland's Robert H. Smith School of Business at College Park. "You have to ask yourself three questions: Why an MBA, why now and why a particular school?" This decision should factor in your family responsibilities and finances, as well as the strength of your application and your long-term career goals. The LRO Project and the Thrill Hill Gang, originally uploaded by geosteph. Geosteph you are a rockstar too ! This was not a prepared speech and i had others vying to take the attentions away. You will find this funny at best. img0008, originally uploaded by scripsi_scriptum. At the launch party for Geoff Livingston's book "Now is Gone" ISBN-10: 0910155739 I enjoyed talking to his Grandma Muriel. Very bright and excellent conversationalist- spent many years in France where they ran a winery. I hope i meet her again. Geoff's book is good. I just finished it today. Its cool that Yahoo beat Google in offering driving directions in India. I wasn in India in July. Who drives their own car anyway when visiting. After nearly 10 years in the US I am scared to drive. Still Yahoo's step is a cool thing that will give Yahoo an edge. Yahoo has a bigger presence in India than Google according to Fortune. I tried out a route that I had gone many times in July and the directions seemed quite accurate. I will give good marks to Yahoo. I was reading Fortune's article on the issue Oct 29th (Online version) and was amazed that India has a 400 million workforce. Extraordinary Human capital. With the dollar value weakening Indian powerhouses are seeking to buy companies. A few months ago Tata motors was mentioned as a possible suitor for Chrysler. Now its going after Landrover and Jaguar from Ford. Growing up in India I remeber the brands like Imapala were owned by filmstars and it would a couols of months if not years for new music releases to make it to India. Now Indian internet users are probably buying music online. My Son in Daycare, originally uploaded by sbell1508. They send cell phone-based service to send you text messages with the information you need to make smart seafood choices. Mobile device: The group also is launching FishPhone (http://fishphone.org), a Web site formatted for Web-enabled cell phones and PDAs. I wish they had the fishphone.mobi domain. Question: What country is losing paid Internet subscribers, but adding users? Answer: India, with the unusual distinction of being possibly the only country in the world losing Internet accounts, as in the second quarter of 2007 the number of tertiary users fell by 50,000. Yet, more Indians than ever report going onto the 'Net to surf or check email. How is this possible? Because, Net users are now accessing through their cell phones. On Sunday in the Parade magazine I liked the one common sense suggestion from a Doctor to practice hygiene. Leave your shoes at the door. It will be a fun interview for a couple to do--who doesn't like talking about how they fell in love? If you're interested or know anyone who might be, please e-mail me at mconrad@washingtonian.com. Thanks!" Whats up with Sun's Java stock? In the tech business JAVA is pretty important for a lot of Web Based applications. WHy is ti them the stock of Sun Microsystems (JAVA) trading at $5.76 (52 Week Range $4.50 - 6.78)I guess thier giving away of the software is not making the stock the favorite of Wall Street. Just saw a post on Facebook from Marissa Conrad ( Freelance Journlaist)reproduced below. Really amazing and I am sure she will get a lot of leads. Social networks are the way for future communications.I have seen several Washington Post journalists on Facebook and Exchanged some plesantries with DOn Graham the head honcho of Washington Post. The very fact that he replied tells me that they take Facebook seriously and are organized to respond. If you're interested or know anyone who might be, please e-mail me (Marissa) at mconrad@washingtonian.com. Thanks! Network Solutions participating in the EcomXpo with $2,800 value giveaway ! From Oct. 9-11, 2007, Network Solutions® is participating in the EcomXpo, a virtual tradeshow for e-commerce marketers. As part of this event, we’re giving away a Top 10 Search Results package that provides expert search engine optimization (SEO) to get your web site ranked on the first page of search results. This is a $2,800 value! To enter for your chance to win, simply register for the expo (it’s free) at www.ecomxpo.com and visit the Network Solutions virtual booth. I must have missed this story earlier. I saw this small item in the Business Briefs section of the Washington Post and nearly fell off my chair. Joining NetBank seemed cool and getting 5000 Marriott Rewards points was definitely a plus. I understand that all deposits below 100k will be taken over by ING bank. I am not worried, I like ING bank and wanted to be a member. I hope there are no migration problems. This seems surprising that you don't get notified of a bank closing. To be rationla that is probably to prevent a run on the bank. I look forward to getting my dollars back or atleast see them in an account. I will keep you posted.